STRIKE ONE: Are these drastic times yet for the Colorado Rockies? Is it time for drastic measures? Conventional wisdom says of course not. We’re 10 games into a 162-game season. This is no time to panic. And you’re hearing the same refrain out of Boston and Chicago too. The major difference of course is that in Boston and Chicago they aren’t already five games behind the two-time defending NL Champion Los Angeles Dodgers. As with the Nuggets situation, the Rockies may not be at the Dodgers level, but they still have a great shot at earning another spot in the post season. But some things need to change. Preferably soon. As a manager, you never want to pull the plug on someone too soon. The club has made an investment and you want to see a return. You know guys are giving it their all. But if you wait too long to make necessary changes, you risk hurting the ballclub. So when the time comes and changes happen, they won’t be coming too early. The Rockies will likely need to try different line-ups, positions and roles for a team that’s only won three of their first 10 games. What can they do? The Dodgers offer that blueprint, actually. Over the past several seasons, LA has never been hesitant to move players around the field. Cody Bellinger has played centerfield; right field and first base in the same game…like they do in high school. Chris Taylor, Kiki Hernandez, Max Muncy and others have done the same. In LA, you’re not an outfielder, you’re a baseball player. The Rockies have done some of this too, just not to the same extent. Ryan McMahan in particular has moved around the infield and done just fine. So what about trying some other moves and combinations? For example, the rap on uber-prospect Brendan Rodgers is his infield defense, which they feel is not up to big league standards just yet. So why not try Rodgers in the outfield, where the team’s defense has been less than stellar so far anyway? And maybe it’s time to investigate the idea of Charlie Blackmon learning to play first base? As far as the pitching goes, touted prospect Peter Lambert is probably worth a look at the back end of the rotation. As inspirational and valuable as Chad Bettis is, sending him out there every fifth day may be too taxing on him physically at this point in his career. Maybe Bettis is better suited for a bullpen role now? Maybe Antonio Senzatela will be ready for a return to the starting rotation soon? This is a lot of “maybe…..”’s to be sure. But this is not a maybe: The Dodgers aren’t coming back to the pack any time soon. This is also not a maybe: For Colorado to make it three straight play-off appearances, they’re going to have to take a lot of chances, starting very soon. Wanna argue? Hit me up on Twitter @MarkKnudson41. 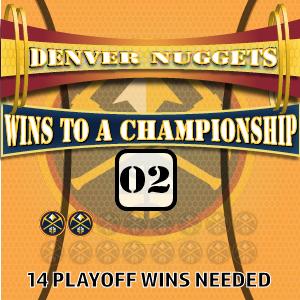 Coming Wednesday: Do we like the Nuggets play-off match ups?